This report* provides a broad overview of the landscape of climate change governance in Afghanistan in order to identify past achievements and current and future entry points for the further mainstreaming of climate change into the country’s national development framework. 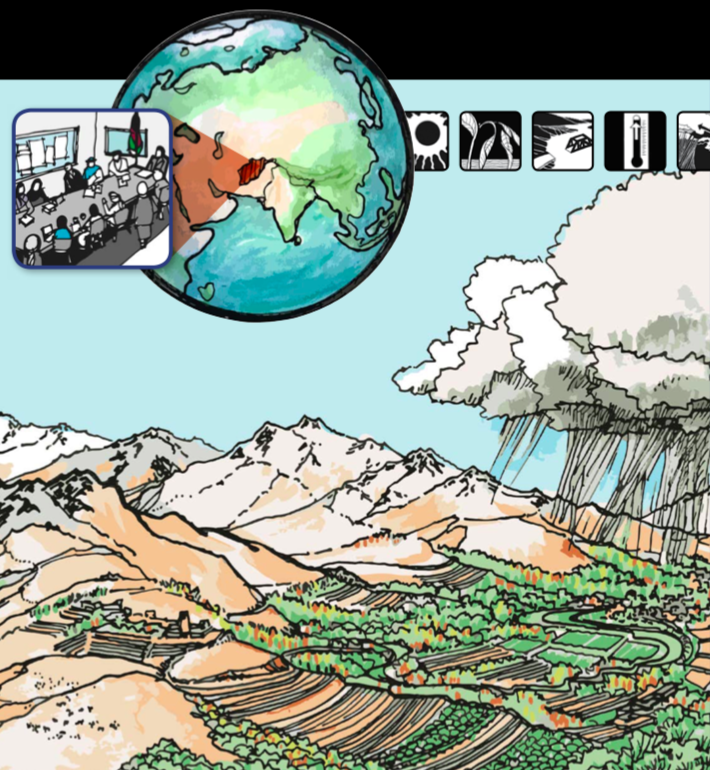 In doing so, this report complements existing research and literature on climate change in Afghanistan, such as the National Adaptation Programme of Action and National Communications under the UNFCCC, to bring the urgency of climate change to the attention of the Government, non-governmental organizations, civil society, academia, and the international development community. This report focuses primarily on the government institutions, legislative frameworks, sectoral policies and strategies, and interministerial coordination mechanisms relevant to addressing Afghanistan’s urgent climate change adaptation and mitigation needs. Particular emphasis is placed on the most crucial areas identified in Afghanistan’s National Adaptation Programme of Action: agriculture, biodiversity and ecosystems, energy and infrastructure, forests and rangelands, natural disasters, and water. The urgency of mainstreaming climate change into Afghanistan’s development processes cannot be overstated. In 2015, the National Environmental Protection Agency (NEPA) and the United Nations Environment Programme (UNEP) developed the most up-to-date and detailed climate change projections for Afghanistan, which suggest that by 2100 the country will see a strong increase in mean annual temperature coupled with an overall decrease in water availability. These changes will have myriad impacts on Afghanistan’s diverse ecosystems, as well as the plants and animals that inhabit them. Considering that approximately 80 percent of Afghanistan’s population relies directly on the natural resource base for their livelihoods, these climatic changes also have the potential to seriously disrupt the foundation of the country’s economy, stability, and food security. Afghanistan is already highly vulnerable to natural hazards, and a changing climate is likely to significantly exacerbate their impacts unless measures are taken to strengthen the country’s adaptive capacity. Mainstreaming climate change into Afghanistan’s development processes is an essential step towards realizing that adaptive capacity. Thus, coordinated action is urgently needed among diverse partners and across numerous sectors to ensure that the risks of climate change are minimized and that development progress is not undermined. In addition to government institutions, the governance of climate change includes a wide spectrum of civil society, non-governmental, academic, private, and community based organizations and structures (see section 2.2.2, page 12 of the report). Not all sectors or people will be affected by climate change equally or in the same ways. Thus, coordinated action and support from all stakeholders is needed as they each have their own unique capacities and roles to play in building the country’s adaptive capacity and resilience. The involvement of civil society and non-governmental organizations is essential for addressing climate change impacts, particularly in terms of community organization and representation of people’s needs and interests. Afghanistan is eligible to access a number of multilateral and bilateral financial and technical resources to address its climate change adaptation and mitigation needs (see section 2.3). Afghanistan’s Climate Change Strategy and Action Plan (ACCSAP) should be urgently finalized and implemented as a primary step towards mainstreaming climate change into national development plans. Comprehensive capacity-building programmes should be implemented at the national, provincial, and local levels in order to raise awareness of, and support for, the mainstreaming of climate change within all levels of the country’s governance processes. Accurate and sound scientific analysis of climate change impacts and adaptation measures should be brought to the attention of policy-makers to encourage further mainstreaming of climate considerations into sectoral planning and reduce the adverse impacts of climate change on the country’s population. Civil Society and Non-governmental Organizations (NGOs), particularly involving women and youth, should be involved in awareness-raising events and capacity building activities to generate greater public awareness of climate change and foster greater political will to address Afghanistan’s urgent climate change needs. Climate change should be integrated into higher education curricula to promote further mainstreaming across relevant disciplines as well as build national capacity to understand and apply key climate change adaptation and mitigation approaches. The technological needs for both adaptation and mitigation should be identified for each sector and vulnerable area. Current efforts, which include those through the Climate Technology Centre and Network (CTCN), should be expanded and prioritized in the national development agenda. Public-private partnerships should be promoted to increase availability of funds and resources for climate-friendly technologies, particularly in the areas of decentralized energy and rural electrification. Infrastructure projects should integrate climate-proofing (preferably with ecosystem-based adaptation) in order to better protect roads, bridges, water supply, energy, and other infrastructure from extreme weather events and ensure that development progress made in recent years is not undone. The Ministry of Agriculture, Irrigation, and Livestock (MAIL) and NEPA should launch a work programme of scientific research and piloting of drought-resistant crop varieties and Affordable Micro-irrigation Technology (AMIT) in order to build a body of knowledge and institutional capacity to better address a warmer and drier future climate. In rural areas without access to electrical grids, decentralized, low emission, and climate-friendly energy projects should be prioritized in order to provide accessible energy to rural populations and stimulate rural economic growth. A comprehensive survey of forest and rangeland species (flora and fauna) should be conducted in order to identify which species are most threatened by and resilient to climate change, and subsequently integrate these findings into national forestry and rangeland management policies. In rural areas, community-based water harvesting, water conservation, and watershed management techniques and practices should be promoted in order to improve management of existing water resources and decrease vulnerability to droughts. *See the full report for detailed recommendations and sector-by-sector discussion. Doosti, A.A., and Sherzad, M.H., 2015. Climate Change and Governance in Afghanistan. National Environmental Protection Agency.